Less than a month before Congress votes on whether to reauthorize a controversial program mandating healthier school lunches, a new study confirms the suspicions of school officials—many students are putting the fruits and vegetables they’re now required to have straight into the trash, consuming fewer than they did before the law took effect. The new study, published online in Public Health Reports on Aug. 25, is the first to use digital imaging to capture students’ lunch trays before and after they exited the lunch line. It is also one of the first to compare fruit and vegetable consumption before and after the controversial legislation—the Healthy, Hunger-Free Kids Act of 2010—was passed. 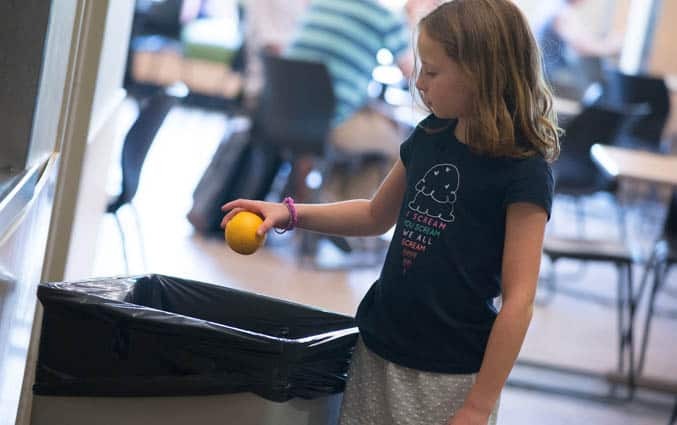 After passage of the legislation and the U.S. Department of Agriculture (USDA) mandated it in 2012, the study found that students put more fruits and vegetables on their trays, as required, but consumed fewer of them and increased waste by approximately 56 percent. “The basic question we wanted to explore was: does requiring a child to select a fruit or vegetable actually correspond with consumption,” says Sarah Amin, Ph.D., a researcher in Nutrition and Food Sciences at the University of Vermont and lead author on the study. The research team used a digital imaging method that they validated three years ago in the Journal of the Academy of Nutrition and Dietetics to measure consumption. Amin and her co-authors documented almost 500 tray observations over 10 visits to two elementary schools in the Northeast before implementation of the USDA guideline and almost twice as many observations afterwards. Forty to 60 percent of the students at the schools qualified for free or reduced lunch, a marker for low socioeconomic status. The new methodology, which involved visual estimations and calculations based on digital photographs of trays as students reached the cashier and again after they passed the food disposal area, was faster and more accurate than conventional methodologies that simply weighed food waste. “The beauty of this method is that you have the data to store and code to indicate what was selected, what was consumed, and what was wasted as opposed to weighed plate waste, where everything needs to be done on site,” said Amin, who hopes to develop an online training tutorial that could be used by schools across the country to measure consumption and waste. In an earlier study published in the Journal of Child Nutrition and Management, Amin and colleagues looked at what types of fruits and vegetables children selected prior to the new guideline. They found that children preferred processed fruits and vegetables such as the tomato paste on pizza or 100 percent fruit juice rather than whole fruits. Once schools have fully acclimated to the guidelines, Amin thinks consumption will increase, especially for students who entered as kindergarteners under the new guidelines in 2012 and know no other way. Amin’s co-authors at the University of Vermont include research associate Bethany Yon; Rachel Johnson, the Robert L. Bickford Jr. Green and Gold Professor of Nutrition and Food Sciences; and Jennifer Taylor, a graduate student at UC-Davis.